If Gossip Girl taught us anything, it’s that no matter high school, college, or “the real world”, rumors never die. And they especially don’t die when they’re about ghosts. Different students come and go through SUNY Plattsburgh’s oldest residence hall each year, but the spirits residing here are much less likely to pack up and move on when commencement rolls around – or so we’ve heard. Both students and locals seem to widely accept hauntings within this four-story Georgian-style building on Broad Street (named after Commodore Thomas Macdonough, one of the Adirondack Coast’s most famous military heroes from the Battle of Plattsburgh). But reasons behind the hauntings remain pretty ambiguous. Throughout our research, Alyssa and I heard a jumble of myths involving ghosts and strange occurrences within the building. 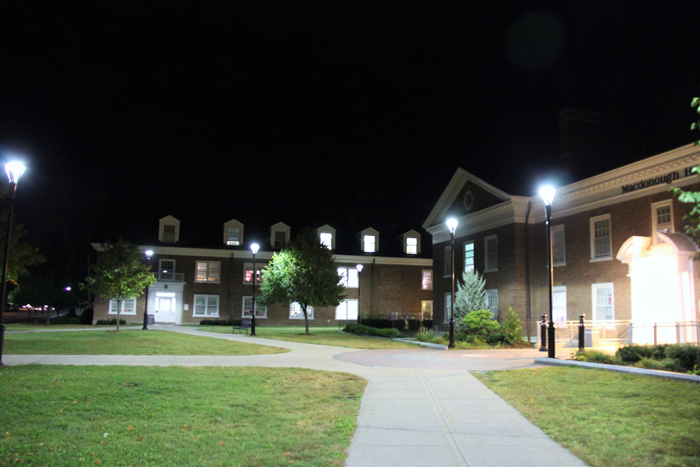 Utica-based radio station Lite 98.7 even cited Macdonough Hall as the reason behind SUNY Plattsburgh’s spot on their “Top 13 Most Haunted Colleges in New York State” list. So Alyssa and I decided we wanted to separate the real from the fake and the fake from the real – by tracking down the people who would know best: SUNY Plattsburgh students. With permission from college administrators, Residence Hall Director Will Cangialosi gave us a tour of the building and busted a few of the above mentioned myths in the process. 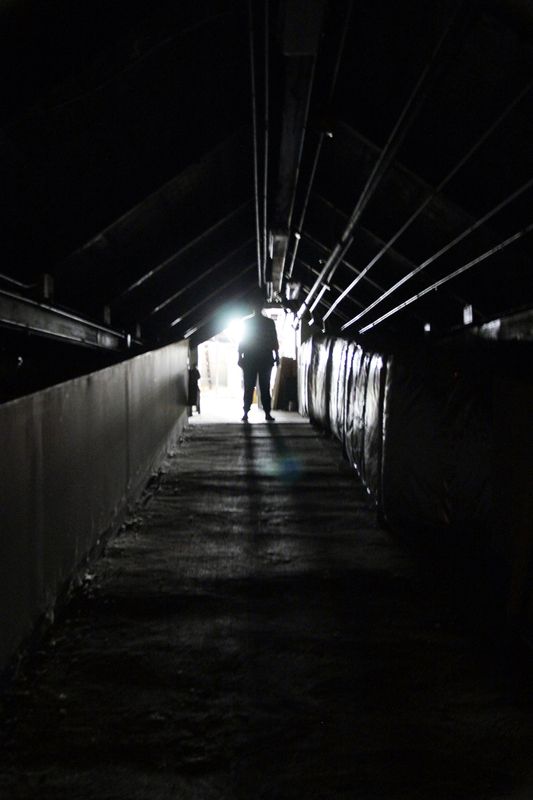 Myth: Macdonough Hall’s basement was once used as a Morgue. 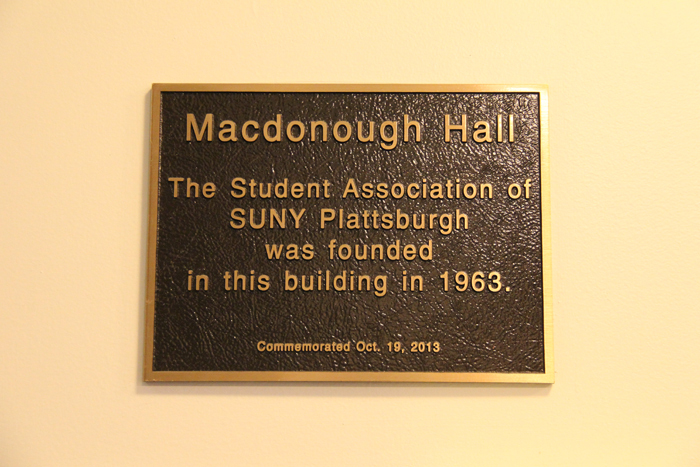 It turns out, Macdonough has exclusively served living, breathing students since its construction in 1951. Within a decade of opening its doors, the building became the school’s original campus center containing a dining hall, student activities center, health center and dorms. In 2005, the whole building was renovated – including the basement – which now contains an entire floor of rooms for students. Will says the morgue idea probably came from the bomb shelters below the basement, which include passages and brick archways (think catacombs). Makes sense, since Plattsburgh was a huge target during the Cold War, mostly because of the nearby Airforce Base. Alyssa and I weren’t able to confirm or deny any creepy happenings in the passages though, because even Will doesn’t have a key to that part of the building. It’s shut off to residents. 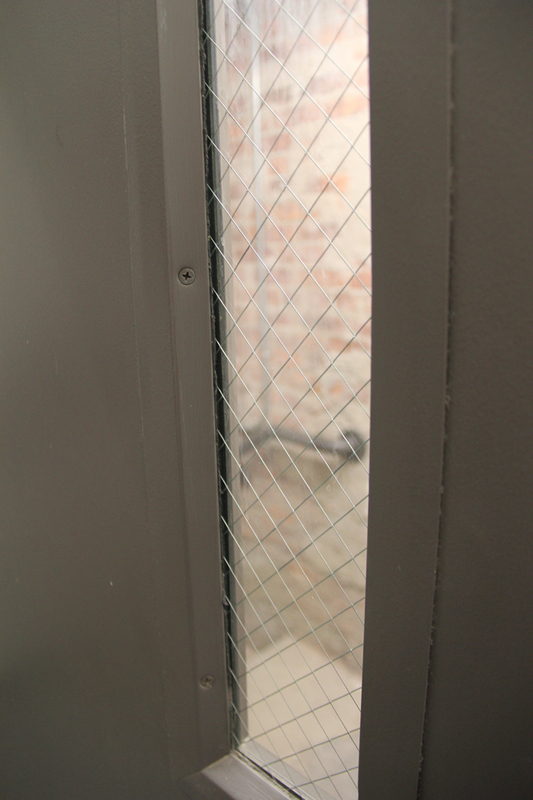 But we couldn’t help thinking: it’s a good thing locked doors have two sides. Then again, if you’re a ghost, that doesn’t really matter. Myth: Macdonough Hall’s butler, Mortimer, murdered a girl in the attic. Now that we know the building has only ever been a residence hall, we can scrap this one too. I mean, unless you attended a bourgie college with butlers included in room and board. In which case, I would obviously stand corrected. Still, fact or fiction, a spooky story is a spooky story, so here goes: Mortimer, the deranged family butler, killed the daughter of his employer and hid her body among the bricks in Macdonough’s attic walls. That’s why sometimes you can hear a young girl crying and a man laughing… sinisterly… MUAHAHA. Cue flashlight underneath my face. Okay, so this story is actually just the product of some serious senioritis. But the alum who made it up is a tax attorney now, so don’t worry. He overcame the senioritis and is now fully cured. And just for funsies, Alyssa and I asked Will to show us the attic. We learned that a little over a year ago some PSU students brought a Ouija Board up there and held a séance. Resident assistant MacKenzie Dumas was in the group and says nothing particularly weird happened while they were playing Ouija, but that doesn’t mean she hasn’t had weird experiences at other times. Want to know more? Check out a video of Will and MacKenzie explaining their own haunted Macdonough Hall happenings on the Adirondack Coast’s Youtube channel. Myth: Graves were unearthed during the building’s construction… and the headstones have since disappeared. So, then maybe it’s not even the building itself that these spooky stories are attached too – maybe it’s the surrounding land. Macdonough has an east side and a west side. The side with the most reported “activity” is the east, according to Will. Why? Well, we humble bloggers can’t say for sure, though this does happen to be the side closest to Riverside Cemetery. We also know that the land behind the building was used as a public hanging grounds during the 19th century (you know, when public hangings were acceptable and stuff). In fact, during construction, two graves and a bone were uncovered by a bulldozer from the surrounding marshlands. Historians confirmed that one headstone belonged to Mrs. Benjamin Vaughn – the wife of the man who built the Kent-Delord House – while the other remained mostly illegible. And the bone? Well, it could have been a chicken wing for all we know, but hey, still creepy. While construction continued, these artifacts were set along a nearby sidewalk, but later disappeared. Does Benjamin Vaughn’s wife still wander the nearby cemetery and property on the east side of the residence hall in search of her headstone? Yikes, who knows! But if she does: girl, it might be time to throw in the towel. Myth: Macdonugh Hall was explored by the Northern New York Paranormal Research Society (NNYPRS). 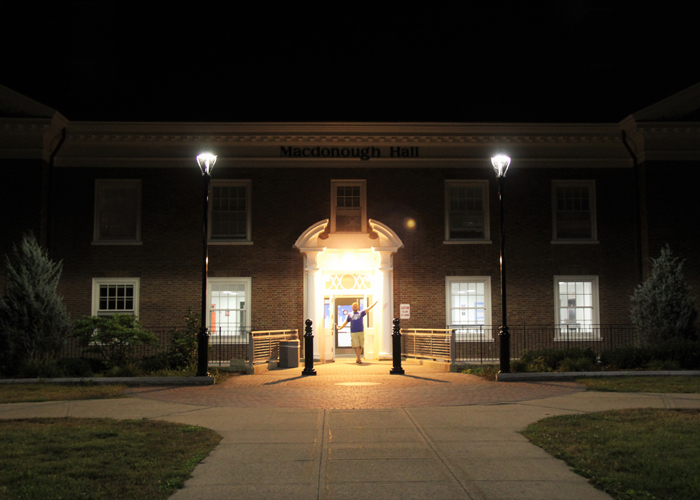 NNYPRS came primarily to check out the City Rec Department, but they stuck around to see – or in this case, hear – what was happening in Macdonough Hall. Over the years, students have reported hearing crying and laughing in empty rooms and halls, self-flushing toilets, furniture falling over. Reps from NNYPRS reported hearing “a lot of interesting sounds” – but couldn’t determine whether or not they resulted from student residents or otherworldly residents. 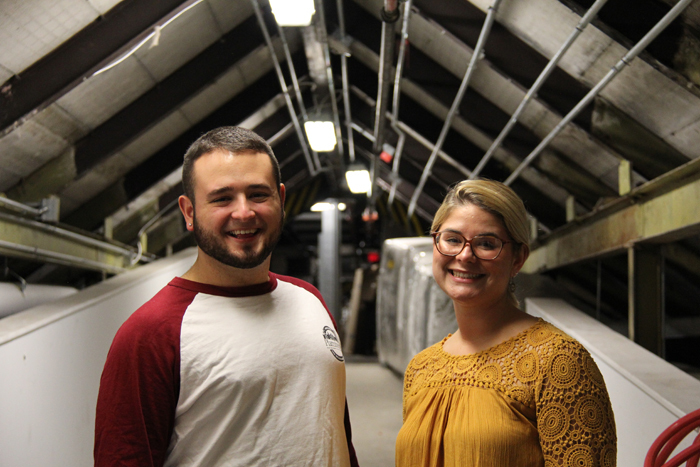 While the professional opinion on Macdonough Hall’s ghosts might be inconclusive, students still say weird stuff happens.